This traditional dish of Bosnia and Herzegovina dates back to the Ottoman Times. Like most dishes from the region, the ingredients (chicken and a slew of vegetables) are cooked together on a low heat over several hours. You can taste the patience and love with every spoonful of the thick and delicious soup. You will have committed the greatest mortal sin if you visit Sarajevo and don't indulge in cevapcici, the unofficial national dish of Bosnia and Herzegovina. They are served in portions of 5, and alongside grilled pita bread and chopped onions. 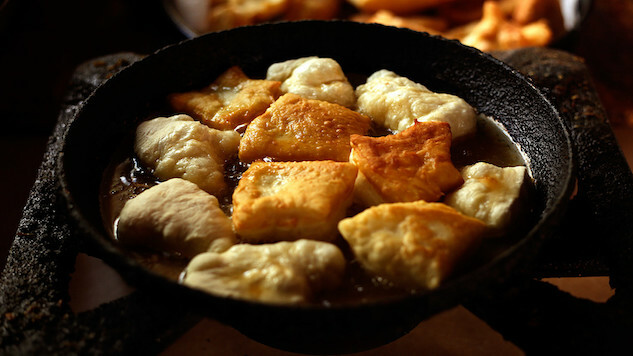 These delicious little balls of fried dough can be eaten savory or sweet. Whether you prefer them with cured meats and cheeses, or alongside honey or jam, uštipci are the breakfast of champions, and a perfect meal after spending time up the mountains. The hardest part of eating this nutrient-rich and super healthy dish is overcoming the mental barrier. But once you try this mouthwatering superfood, you will be happy you gave it a shot, and your body will certainly thank you! Bosanski Lonac is a rich and hearty stew made with large chucks of meat and vegetables. It is prepared by alternating layers of meat and vegetables in homemade broth until the pot is full. You cannot eat this dish without a beautiful feeling of satisfaction. The Balkan region is known for its dolmas, fermented vegetables stuffed with rice, meat and seasonings. Each dolma has its corresponding name according to vegetable (japrak: stuffed grape leaves; sogandolma: stuffed onion, etc.). But sarma – delicious minced meat, rice and seasoning rolled up in fermented cabbage – also has a special place on the dinner table. This dessert came by way of the Ottomans. Tufahija is one of the less decadent desserts in Bosnia and Herzegovina. It is made by stuffing apples with walnuts, and then stewing them in a mixture of water and sugar. They are an absolute delight as you enjoy your Bosnian coffee. The chase to discover the next new thing is a constant in the travel industry. For many travel experts, the Balkan Peninsula—in Southeastern Europe—is that thing: largely untouched, incomparably beautiful, and still clinging to old-world customs. Balkanvibe is the premier travel platform for the Western Balkans, offering the widest range of tours for the region as well as a seamless booking and credit-card payment system. In a partnership with Paste Travel, Balkanvibe will bring readers a biweekly, insider look at the ways in which this magical corner of Europe retains its authenticity and undiscovered charm. The Western Balkan region is an amalgam of cultures, languages, ethnicities and biodiversity. Despite these differences, there is one characteristic all Balkan countries share: No matter what you say, Grandma will remain convinced that you haven’t eaten enough. Though architecture and museums might provide a glimpse into a new culture, nothing is quite as revealing as food. In the last 150 years, Bosnia and Herzegovina has been part of six different empires, kingdoms and republics. As can be expected, the impact of these influences is reflected in the country’s culinary customs. Everybody knows that when visiting Sarajevo, you absolutely must not leave without a taste of the legendary cevapcici, grilled sausages served with pita. However, though Sarajevo is the Grill Capital of the Balkans, meat is not the only food for which the city is known. Bujrum in Bosnian loosely translates to “you’re welcome to join me,” especially in the context of eating. So, bujrum as we dive into, and uncover, Sarajevo’s gastro world.